That’s right, lock snapping is a common practice used to break into people’s homes. It doesn’t require any specialist tools or skills and it can be done in minutes. The only way to prevent lock snapping is by installing anti-snap locks. 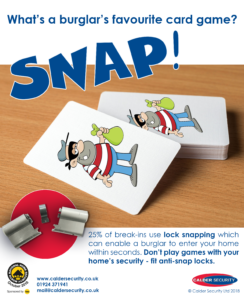 You can read more about anti-snap locks here. Please share this meme on social media to help spread the message.